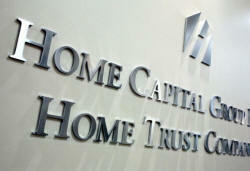 [May 11, 2017] (Reuters) - Canada's biggest non-bank lender Home Capital Group Inc said on Thursday its high-interest savings deposits were expected to have fallen to about C$128 million ($93 million)following the completion of Wednesday's settlements. Deposits were expected to have fallen to about C$134 million following completion of Tuesday's settlements. Depositors have withdrawn more than 90 percent of funds from Home Capital's high-interest savings accounts since March 27, when the company terminated the employment of former Chief Executive Martin Reid. The withdrawals accelerated after April 19, when Canada's biggest securities regulator, the Ontario Securities Commission, accused Home Capital of making misleading statements to investors about its mortgage underwriting business. The company, which is set to report its results after markets close on Thursday, has said the accusations are without merit. Home Capital relies on deposits from savers to fund its lending to borrowers, such as self-employed workers or newcomers to Canada, who may not meet the strict criteria of the country's biggest banks. Last month, the company agreed to receive C$2 billion in emergency funding from the Healthcare of Ontario Pension Plan (HOOPP). It has so far drawn down C$1.4 billion from that facility. The company said on Thursday its liquid assets stood at C$1.02 billion at the end of Wednesday, which, combined with the funds not drawn down on the HOOPP credit facility, gives it access to available liquidity and credit capacity of C$1.62 billion.